60° discharge angle, 150° rotational arc. 171 ½” wide x 45″ deep bucket. Unit accepts and discharges up to five (5) totes at one time. Loaded via forklift truck at approximately 40″ above floor level. 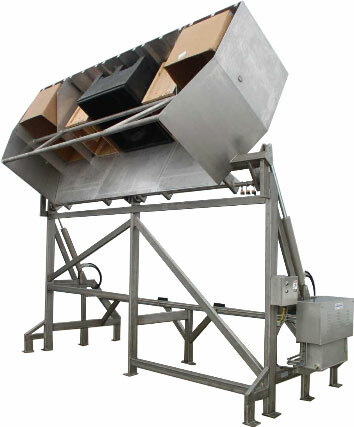 Washdown duty 304 stainless steel tube frame with continuous welds. Pivot carriage rotates on four-bolt nickel-plated flange bearings. 5 GPM Parker hydraulic pumping unit. Pumping unit features stainless steel reservoir and enclosure for easy equipment cleaning. Controls mounted in a Hoffman NEMA 4X stainless steel water-tight enclosure.